Sausage-and-cheese bread is a great meal or appetizer to share with friends. t Are you looking for a quick and easy meal that will feed a lot of people? We all have busy schedules, and we need shortcuts. 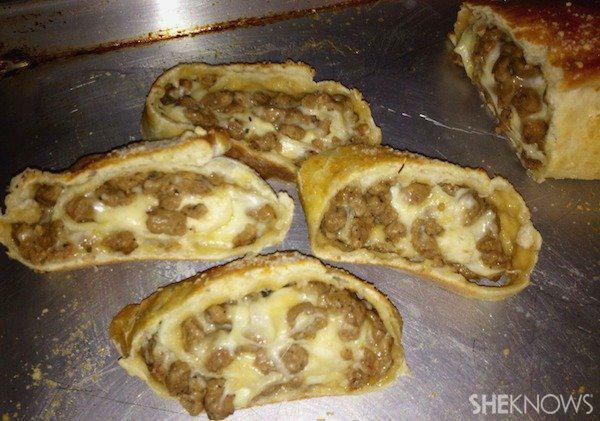 Sausage bread is one of those recipes that I can prepare and bake in about 35 minutes. t Using Jimmy Dean Fully Cooked Crumbles makes this recipe so much quicker to prepare. If you have a hungry crowd waiting for some food, this is quick, easy and filling! t You can serve this dish as an appetizer or the main course. It is really easy to make enough to feed a crowd. And the best part is that you only need a few ingredients. Preheat your oven to 375 degrees F and lightly grease a cookie sheet. Starting at the top of the dough, roll the dough into the shape of a long rectangle. Then shape it into a horseshoe to fit on your cookie sheet. Place the dough carefully on a greased cookie sheet. Brush your egg white on top of the dough and close the ends. Sprinkle the remaining Romano cheese on top of the dough. Bake for 25 minutes, until the dough is a nice golden brown. Let it cool for a few minutes and then cut it and serve. t You can also serve this with tomato sauce as a dip. t Jimmy Dean Fully Cooked Crumbles provide a quick and easy way to add a dash of delicious to any recipe. Since they are already cooked, they help you spend less time in the kitchen and more time with your family. This sausage-and-cheese bread will be a big hit at dinnertime. Look for it in the refrigerated meat section at your favorite grocery store.